O.k. I am not usually in to the tootin humor, but I came up with this idea and I thought that I would see where it will take us. The contest: Comment with a link to the funniest true flatulence story that you have written. Whoever I think is the funniest will win. The deadline: This Friday, April 18th by midnight. 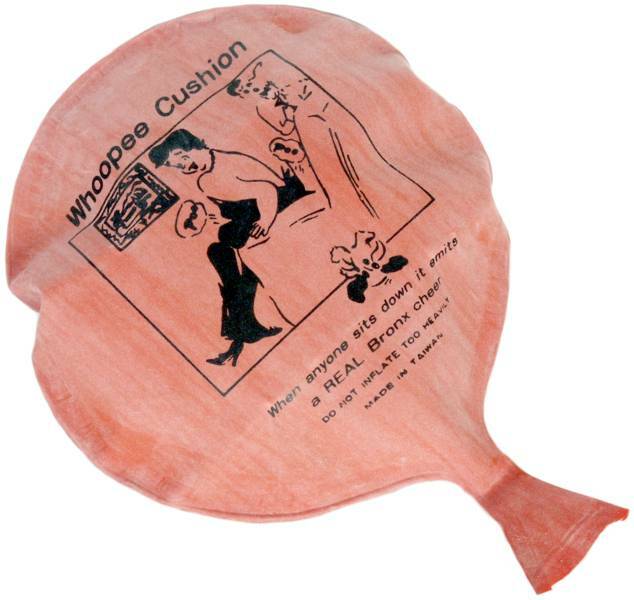 The prize: I will mail this funny whoopie cushion to ANYONE of your choice in the US or Canada as a totally hilarious SURPRISE. Of course it will include this funny joke, a url to your funny blog post, and an explanation of how YOU decided to make someone’s day. O.k. , we are settled, and if this isn’t the funniest contest you have ever seen on the internet, I would like to know about the one that is funnier. And, I can’t leave this post without honoring my father in law, Duane. You will never see the man laugh as hard as when the subject of “tooting” comes up…it literally draws tears from the man. He laughs so hard when we talk of the subject that my brother-in-law Jordan has promised his dad that when he dies, we will have a fart-off at his funeral, just to see if we can hear his laughter one last time, coming from the other side. ← T Benjamin drinks it? I really enjoy, Scooby Doo–so when they made the movie with “real” people we went to see it. In the movie there is a “fart” off scene…well, Jarrett and every 9 year old boy in the movie theater, almost died of laughter. I just sat there, maybe I’m not that funny. . . When my oldest son Oliver was around 2 years old, my mom took him to the grocery. While they were in line, he tooted and it was a grumbler! He looked at her and said, “Nanny!!!”. (That’s what he called her). Anyway, everyone within hearing gave her a funny/dirty look and she vowed never to take hime shopping again. ok that was very funny, there’s no way i could ever top that one. HAHA. You were hating on my contest, and now you have one.